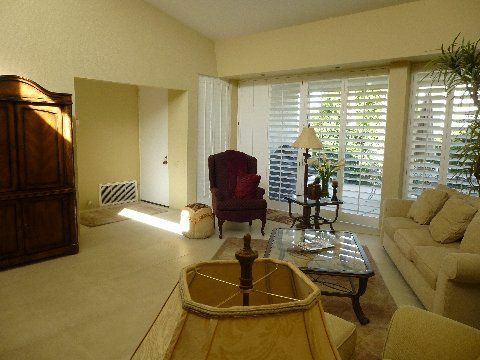 Beautifully furnished, 2 bedroom, 2 bath, generously proportioned 1330 square foot ground floor, single story condo features tile flooring in all public areas and wall-to-wall carpeting in both of the bedrooms. Furnishings are elegant, yet comfortable, in a more traditional style. The open space “great room” plan includes the living room, dining room and kitchen – great for entertaining or just being home alone. The bright and sunny living room features a wall of windows looking out to a private patio area (with gas BBQ), cathedral ceiling and clear story windows. A large TV offers basic cable as well as Netflix and Prime. There is also a DVD/CD/VHS player.. The kitchen is a fully stocked with all you need to cook and entertain, including a large wine cooler. The master suite has a king size bed, attached bath, walk-in closet, TV and private patio area. The second bedroom has a queen size bed with a bath just across the hall. The unit features an in-unit washer and dryer for your convenience. The large, shared community pool is heated with a spa and just steps from your front door. The extensive well-maintained grounds and mature plantings provide a serene setting to enjoy the mountain views and peace and quiet of the complex. Convenient, abundant parking is all around. The Palm Springs Country Club is located in the heart of Palm Springs, just minutes away from the world famous Palm Canyon Drive with its restaurants, art galleries and entertainment venues. Please, no smoking in the unit (two patios) and no pets allowed. Would return in a heartbeat. The owner was quick to return email any questions. He actually allowed us to move in a couple of days early as the condo was vacant. The place was very adequate for my wife and myself. It was well stocked with all amenities like soap, paper towels, sufficient toilet paper. Even had a case of bottled water. The kitchen was well supplied with all necessary utensils and cookware. There were grapefruit, lemons, oranges, tangerines everywhere to pick any time you needed. The pool and jacuzzi (always at 102) were well maintained and the surrounding grounds were immaculate. The place was minutes from shopping, pharmacy, urgent care restaurants, and downtown. The community was gated and my wife felt very safe when I was away playing golf that was also nearby. Overall it was a great place to stay in Palm Springs and we would both return in a heartbeat. Thank you so much P & J for the lovely review. The respect and appreciation is mutual. What a great review, so nice you all had a great time & felt so comfortable in our condo. When we stay in the condo we have always felt the same, safe & comfortable. We’re greatful you appreciated the extra amenities we leave for our guests.